Tales of white characters who have to fight against a particular evil or endure hardships because they are different is a story that nearly every science fiction movie is based on. Their narrative is often one of angst and hardship that has to be overcome. You are meant to sympathise with these characters and root for them as they go on a journey of self-discovery, accepting their uniqueness and going onto killing the bad guy. Science fiction movies have always been known for their inclusion of the other, or that which is different, and while that may be true, the question still remains: Where are all the black characters though? I doubt this is the first time that someone asked this question, or the last time it will be asked because this is a issue that not only science fiction films struggle with, but many mainstream movies too. The reason why I singled out science fiction movies in its struggle for diverse racial representation is because the genre is one that is set in a futuristic, often utopia like, world where everyone is accepting of others and that the colour of your skin should not matter. When researching race in science-fiction films, it was one of the first times that I found Google to have an inadequate answer. It gave me a constant repetition of sources that spoke about this issue, giving their opinion, but no evidence of a concerted effort being made. It seems like we’ve become accustomed to having predominantly white people as the lead of science-fiction films that we don’t really question it. Often when watching a sci-fi movie you never really notice such things because you get so absorbed into the story. It is only later upon further reflection that you will notice if there was a person of colour in the film. Just to clarify, I am aware that those of other races are also underrepresented, but I am primarily focusing on black and brown people because there is such a large number of us in the world but still so few of them appear on screen. In recent years however, people of colour have at least been making appearances in the genre but they are still grossly underrepresented in general. There have been a plethora of science-fiction films that has given us great stories to engage with and but yet somehow characters of colour are still lacking majorly; In Time, Total Recall, Cloud Atlas, and most recently Interstellar are a few of the movies that I can recall where we clearly see one or two people of colour within the films. The recent release of Christopher Nolan’s Interstellar which was a great movie even had more robotic characters than it did have characters of colour. Previous Nolan efforts such as Inception and the Dark Knight Trilogy had also at least one token diverse cast member, which is commendable for the director to have done but overall there needs to be more than one person of colour in movies. In In Time with Justin Timberlake we only see black people within the working class sector where one black character is the girlfriend to the protagonist’s best friend, or within the police force keeping order; when Timberlake’s character enters the upper class sector there is no black character that can be seen. This is another issue in itself that when black people are represented they are still shown to be within the lower classes and slums but I digress. Science-fiction is supposed to be the genre where everyone is accepted and race doesn’t matter but more often than not, these films fail to promote true inclusivity. They deliver the subliminal message that those who do not fit the mould of a white character will be unable to realise their full potential or have the same success of white characters. This creates a problem as it leaves children of colour with the impression that there are certain things they will be unable to accomplish just because they are not white; this is a frightening idea to pass on to younger generations. Representation for people of colour has always been lacking in such a way that people are unaware of the fact that they keep seeing the same type of character lead a science-fiction film or even just have the character have a homogenised look. If we use Suzanne Collin’s The Hunger Games as an example we can see that this also applies. Recently within the adaption of the first book there was an online disagreement that erupted with some of the readers because a character called Rue, who heroically died in the movies, was black. More than a few people were on the social media platform Twitter sharing their disdain at the news that the character in the book that they had formed an emotional connection too was portrayed by a black actor in the movie. While online platforms like Twitter does allow for those of an ignorant nature to cause a louder raucous, it does not dismiss the fact that people have become so comfortable to characters within science-fiction movies being white, that they are surprised when a character turns out to be non-white. Clearly this shows that somewhere there is an issue with the lack of appropriate representation of non-white characters. The film does have the female character of colour Uhura, who plays a love interest to the character of Spock, which does show a positive representation and having another character of colour playing the role of the villain, would have in actuality be stating that people of colour fall into different types of categories where some are good and some are bad. Unfortunately they still chose not to have the character portrayed as black. 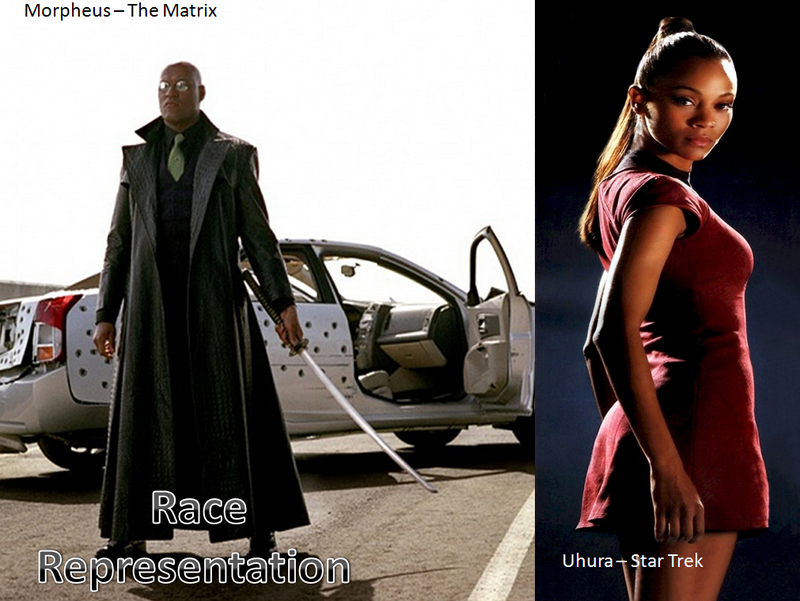 One of the most notable science-fiction films to get the portrayal of people of colour correctly was The Matrix Trilogy. In the start, we are presented with Morpheus, Lawrence Fishburne, who it could be argued is actually calling the shots; he was the one who was coaching the protagonist, Neo, through it. He trained him and he was the one who took Neo to visit the Oracle, who also happened to be black, to find out if he was “The One” just like he had done with the people before whom he hoped would be the one to save their people. Naomi, a fellow ship commander, and Link the computer technician of Morpheus’ ship are examples of a few other characters of colour were portrayed in the films. The films’ representation of people of colour has to my knowledge not been matched by any other science-fiction film since. Representation of minority racial groups and people of colour have been greatly underrepresented within the science-fiction film genre and it is problematic that a genre which sets out to be inclusive is not as inclusive as it should be. In the movie business money talks, it will take the use of paying moviegoers drawing more attention to this issue for the movie executives to take notice. Who knows maybe in 10 years time this will be a non-issue and opinion articles like this will fade from memory? If so, then that will be a day I gladly look forward to.